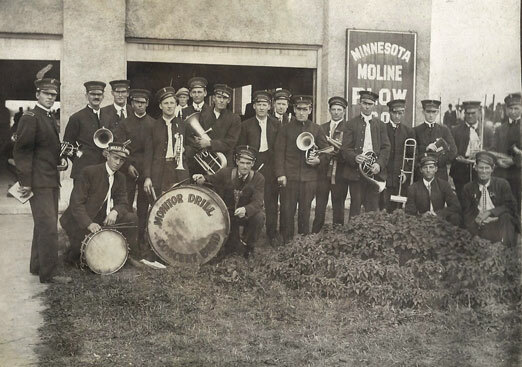 In 1891 we organized a band of 10 men from Horicon [where Monitor Drill moved here from], which was later enlarged to 35. We went on many trips and usually played at the State Fair. In the early years we took the train from the Milwaukee Depot. We sponsored many Village activities. Our 4th of July celebrations were always a big affair and the entire Village took part. Everyone would bring their lunches and entertainment would be racing, catching greased pigs, climbing a greased pole with a purse on top was always a big drawing card. We usually would end up with a dance in one of the halls. We had one band stand or meeting place near the Monitor and this was taken down by one of the storms. We also played many times in the pavilion on the hill above the Monitor. This building was torn down by the Dan Patch [Railroad] construction. Later one stand was built in the park across from the old fire barn and this was also blown down. For several years we had no place to meet or practice and the band of the Village sort of went by the way. The Monitor Drill Concert Band, directed by C.J. Bradley, performed at the big Fourth of July celebration in 1914 – see Celebrations. 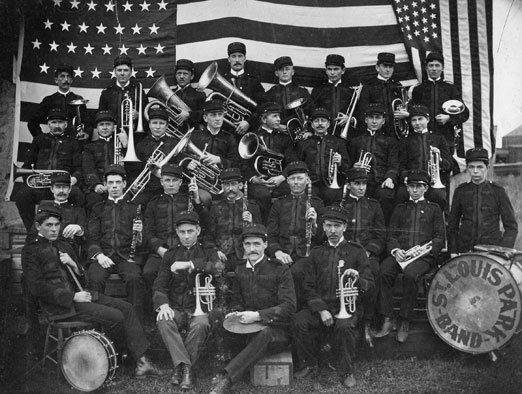 The Minneapolis Journal reported that the St. Louis Park Band made its debut at the Memorial Day Parade in downtown Minneapolis on May 30, 1900. The band was led by cornet player Zeph Wood. They started out on the grounds of Monitor Drill, then built their own practice hall on Lake and Monitor (Republic Ave.). One report is that they practiced in the dining room of the Commers House Hotel, also known as the Blind Pig. Later they met at the Brick Block. The St. Louis Park band again marched in Minneapolis’s Memorial Day Parade on May 30, 1901. On July 26, 1901, the St. Louis Park and Hopkins community bands gave a combined concert at the pavilion in St. Louis Park. We think this was a structure by the railroad tracks in South Oak Hill. W.H. Wilcox, chairman of the committee, presented an opera fan to Miss Sadie Williams for selling the most tickets. As early as 1902, and perhaps earlier, the Village Council supported the band by appropriating $100. Members of the band in 1904 included Bud Haskell, John Dryer, Nels Neilson, Bert Williamson, Adolph Jensen, Harry Blackton, Carl Nelson, Zeph Wood, Charles Bradley, Bill Lewis, Henry Jensen, Frank Bradley, Oscar Nelson, Erick Liljenfors, Joe Williams, and Walt Moore. The family of Arvid Carlson, who played the cornet in the band, donated a glass-enclosed copy of the photo below to the Historical Society, and the cornet is still in the family! A Grand Ball and oyster supper were given by the St. Louis Park Band on the night before Thanksgiving, 1910. The invitation didn’t say where the Ball would be given! Tickets were $1.00. A Fireman’s carnival was held at the Bandstand on August 8, 1913, to raise funds for the new library. About $1,000 was raised. Food was supplied by the various churches. Before these carnivals, the firemen held a dance on the night before Thanksgiving. The carnivals started out as ice cream socials, with the fire department receiving the profits from sales of pop, ice cream, watermelon, and hamburgers. A parade by the Village band, with members representing all five districts of the village, started the proceedings. The St. Louis Park Band, along with members of its Fraternal Orders, again marched in Minneapolis’s Memorial Day Parade on May 30, 1914. 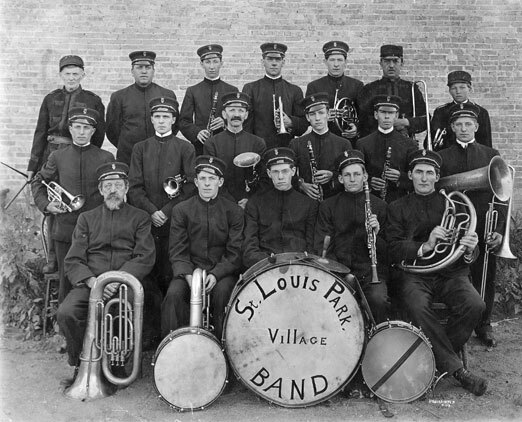 The St. Louis Park Band participated in the Hennepin County Fair, held on September 16 to 18, 1915. The bandstand was lit for the first time in September 1916. The Community Red Cross Circle of St. Louis Park gave an ice cream social at Bandstand Park on August 10, 1917, to raise money to make hospital supplies. The St. Louis Park band performed. On August 30, 1917, the St. Louis Park Commercial Club sponsored a banquet to honor the Village’s draftees and Veterans. Part of the festivities was a half hour concert by the St. Louis Park Band. 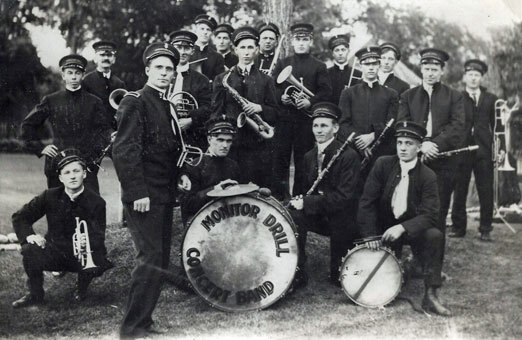 The St. Louis Park band provided the music for an independent football game between the Marines of Minneapolis and the Bilbows of St. Paul at Nicollet Park on October 3, 1920. A St. Louis Park football team was originally scheduled to play a preliminary game but it was called off. The following week, October 17, Park played the Marines, again with the Park Band providing the music. 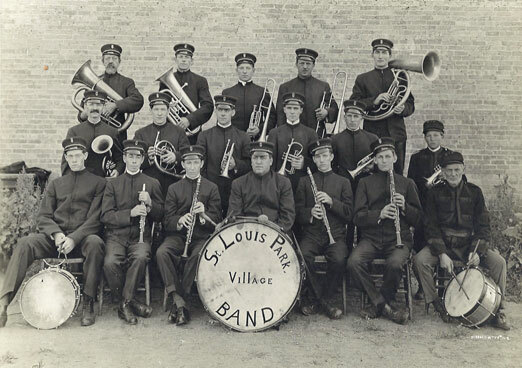 The St. Louis Park Band furnished entertainment at the dedication of Brookside School on September 2, 1922. On November 12, 1922, the St. Louis Park Band provided before game and halftime entertainment at an independent football game between a team from Park and the Liberty-Snyders at the South High football field. An item in the Minneapolis Star reported that fireworks on July 12, 1935, in St. Louis Park would be accompanied by the St. Louis Park Band. One wonders if this might be the High School band? On July 23, 1936, it was reported that the St. Louis Park Band performed at a Lawn party. 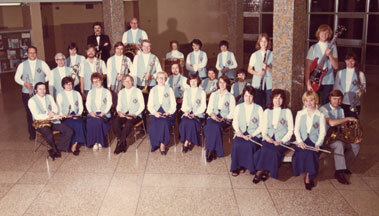 The original St. Louis Park Village Band apparently faded away, just as the Monitor Drill Band had. But in 1940 an effort was made to form another iteration. An article dated July 13, 1940, reported that Clyde Wolford proposed that a St. Louis Park Band be formed. His idea was to form a committee with representatives from the School Board, Village Council, Businessman’s Association and the Village Fire Department (VFD). The minutes of the August 7, 1940, meeting of the VFD say that Kurt Scheibe suggested that the VFD back a Village Band and Jake Werner suggested a meeting with the Village Council, School Board, American Legion, and Businessman’s Association. At the last regular meeting of the fire department it was suggested we do something in regards to the formation of a Village Band. A committee was appointed from the department to work with committees of other organizations. Would appreciate if the Board would appoint a committee of two to meet with the fire department committee at some future date. At the same time it was suggested we plan something for the Aquatennial Parade next year. St. Louis Park the fastest growing Village in the state should indeed be represented in this event. The Board of Education heartily approves of any movement toward the organization of a village band, and wishes to cooperate with any organization sponsoring such a project. At our regular meeting in July, Mr. Wolford was appointed a committee of one to represent the board on matters pertaining to the organization of a municipal band, and was appointed Monday evening as a representative of the Board of Education. The efforts worked out, as there were several performances of the St. Louis Park Municipal Band noted in 1941. The first concert of the season was given at Bandstand Park on June 11, with Harltey J. Schultz conducting. Others were presented on July 2, 23, and 30. The band performed as part of the Miss St. Louis Park contest. On August 20, 1941, the Band also performed at a Minneapolis Millers baseball game. Band concerts at Bandstand Park were presented on Tuesdays through June and July, 1942, conducted by Hartley J. Schultz. A search through the Minneapolis papers archive finds no other mention of the St. Louis Park Municipal Band after 1942. It is quite likely that many or most of the members had gone into the service, and after the War the band wasn’t started up again. A note specifically said that there was no band in 1955. There were a series of bandstands in a park variously called Central Park, Bandstand Park, and ultimately Jorvig Park. The first one was probably built around 1900, and was replaced prior to 1904. The second one was destroyed in the 1904 cyclone and presumably replaced. Another iteration of the bandstand was erected in 1911 with the help of $50 donated by the Village Council in June. Another was built in July 1914 – its predecessor may have been destroyed in the deadly tornado that hit the previous May. This white wooden structure stood for 40 years until it was torn down in 1954. In 1971 Bandstand Park was renamed Jorvig Park in honor of Torval Jorvig. He was a longtime trustee of the Village, a councilman for the City, and a strong voice on the planning commission. It was at this time that the Historic Depot, now owned by the City, was placed in Jorvig Park. Many years went by with no band, but a community band movement was spreading throughout the suburbs, and in 1972, a new community concert band was formed, headed by Lorraine Brasket. She and other interested musicians put an ad in the community education newsletter, asking for volunteers. 16 people came to the first meeting and played for a month before they disbanded for the summer. Another effort was made, this time by calling people who were identified in old volumes of the Echowan as having been in High School band. The group hired Michael Holtz as conductor, paying him a small stipend with funds raised from the City and other fundraising efforts helped by the Lions Club, Boy Scouts, etc. They initially rehearsed at Susan Lindgren, then Central, and then the High School band room. Ms. Brasket, who plays tenor sax, served as President for two years, drawing up bylaws, etc. and getting the group established. Jim Rhodes, who also plays sax, has been President ever since. In 2006 the band had over 50 members, and has had as many as 65. Over one third of the members have been with the band for 20 years or more, and there are three original members. Concerts are given year-round, and the group has played at Orchestral Hall several times. They also perform a Holiday concert at the High School. Rhodes started a program called “Gift of Music” in 1991. This program provides donated musical instruments to students who might otherwise not be able to afford them. Over 400 such instruments have been refurbished and donated, along with lessons. The band strives to demonstrate to young people that music can be a life-long pursuit, not just ending in High School. The St. Louis Park Community Band’s web site is www.slpband.org.